The Soho Electric Fireplace TV lift cabinet is available in two finishes, caramel and espresso to match any décor! Two drawers at the base of the cabinet are perfect for hiding away your AV components. Our built-in infrared relay system allows you to use your remote control to control your components while they are concealed in the drawers. Don’t worry about your TV being in close proximity to the fireplace – a full wall separates the TV and the firebox ensuring your TV stays cool and protected. Want to enjoy the ambiance of the fire but without the heat? The electric fireplace may be used with heat or without to suit your needs. 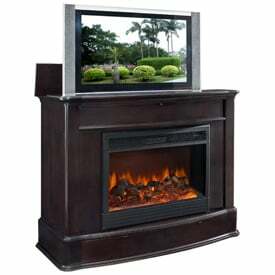 The Soho Electric Fireplace can accommodate TVs up to 55”.